Hello folks!! We all are well aware with the functionality of Google. It is the world’s best search engine which can search almost everything in this entire universe. We all must have used Google extensively in our every day’s to find n number of things or submit our tricky homework or solve our difficult office assignments. Have you ever noticed the blank page with Google Doodle and wondered about it? It is nothing but an amazing trick called Google Gravity. Google Guitar is amazing trick that converts the search box surround into a guitar. With the help of your mouse or gesture you can pluck a string and you are good to go. You can experiment and also play well know songs. It is a fun trick to engage yourself. So, what are you waiting for, enjoy google guitar. Google Underwater is a best trick will all sea lover will enjoy. 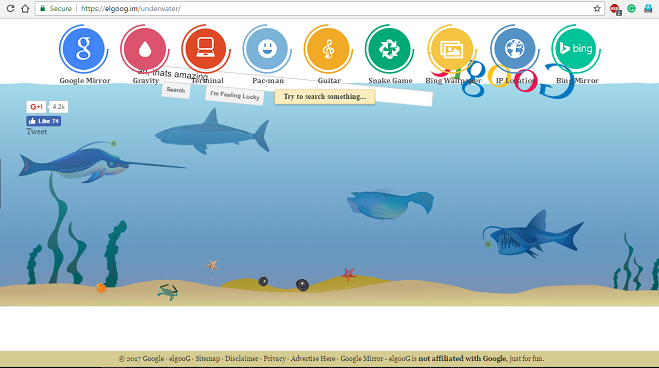 It is very relaxing and you can enjoy the entire time spent in google underwater. It triggers being underwater and drops the search box into the ocean with sea creatures swimming all around it. It’s simple and soothing. Google Sphere is yet another mind blowing trick, it keeps you amuses for a couple of minutes.t The old Google screen from the era of 1990s appears and the search box remains static and all the text around it rotates in a circular motion creating a sphere. It could be similar to that of Pacman but definitely is entertaining. This amazing google gravity trick allows you to perform an Epic Search rather feeling lucky you can feel EXCESSIVE. The search engine will perform its regular function. It is fun for few minutes. The final Google Gravity trick worth trying is Zerg Rush. All gamers are well aware of Zerg Rush and it is amazing trick that actively obstructs the searching process but it is actually a fun to watch it. Google Zero Gravity is the most common but entertaining trick to enjoy. It does same activity each time but it is fun to watch. After the action is complete, the search box can be used. Google Space triggers zero gravity in a funny and interesting manner. It does mind-blowing things and is funny to watch. It will annoy those who would prefer things in ordered manner. Google Pacman is a wonderful trick which is functional for a few minutes. All you need is to hit the Insert Coin and play a quick game within the browser. It is a traditional game but it is challenging and entertaining at the same time. This one is for the coding guy. It converts the search page into MS-DOS-style code terminal. It may appear difficult initially but it is actually very easy to use. The regular search and I’m feeling lucky options are little harder to find but it is fun to explore. Funny Google is for those who enjoy every single silly joke. It is the regular google main page with another window below called ‘Set another name’. Type a word of your choice into the box, click Enter and that word replaces google above the search box. If you are fan of The Lord of the Rings: The Fellowship of the Ring you will keep on giggling at this Google Maps quirk. Try to get walking directions from “Rivendell” to “Mordor” then google will give you the route and also a warning. You can get the fun place where it is located. This is a never-ending search option. This is famous and trending world wide on Twitter. You need to search “do a barrel roll”, then your page will start spinning even before the completion of instruction. Google makes fun of its own “did you mean” suggestions when you search for recursion in the search box. Recursion is nothing but repetition or returning. If you speak Klingon you will know “Google search” means “GoogleDaq ylnej”. “GoogleDaq ylnej” is a Klingon version of Google. There are similar pirate and Elmer Fudd version. Kerning is nothing but space between the letters in a word and it is favourite and loved by the designers. When you enter “kerning” is the search box it will change the spaces between the letters in the word “kerning’ is all the coming results. The response same as that of recursion. Similar to the ‘recursion’ response, when you search for ‘anagram’ it means to rearrange the letters in a word and in return it will make a new word or phrase. If you are fascinated by the beautiful Antarctic on Google Maps, then you would love to find the little orange peg man when you drag and drop it has changed into a chubby tiny penguin when you change to Google Street View. When you click on “I’m feeling lucky’ but not search for anything a catalog of all Google doodles will appear. there are already 69 in 2012. There are many functions in Gmail starting from the filter spam, ads, applying labels and colours but you cannot do your laundry. There is an option to suggest a feature on Gmail page. If you want to move around the Google office located at Mountain View you can watch them through this street view.